Writers Jackson Lanzing and Collin Kelly build a new world for the popular DC Collectibles line. Based on the DC Collectibles line of the same name, GOTHAM CITY GARAGE is a new Digital First series that follows a diverse group of rebels with one cause: freedom for all. Taking inspiration from the fan-favorite statues, the team of Jackson Lanzing and Collin Kelly (GRAYSON) craft the world of GOTHAM CITY GARAGE, flipping the script on some of the DC Universe’s most famous characters including Harley Quinn, Wonder Woman, Catwoman, Lex Luthor and more. The exhilarating new series debuts August 16. “This is an exciting chance to explore the meaning of heroism in a world devoid of hope, to rebel-yell alongside our favorite DC superheroines at a time when we need it the most,” adds Lanzing. 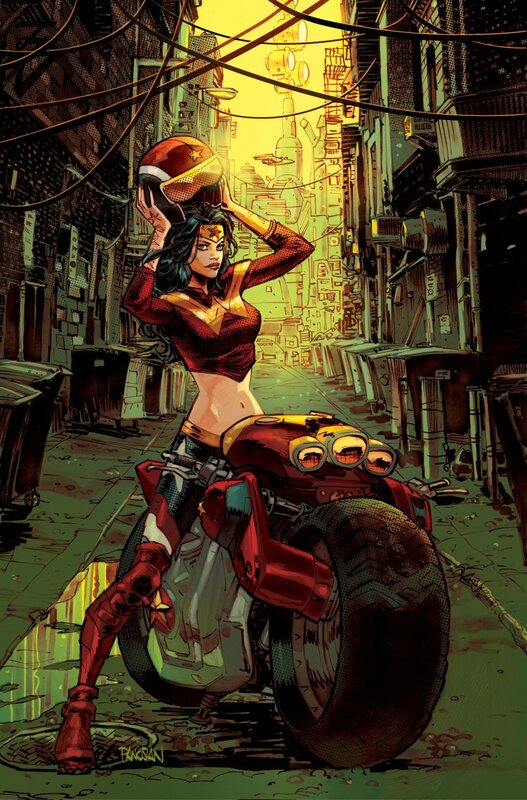 GOTHAM CITY GARAGE debuts August 16, with a new chapter released biweekly through October 2017 and weekly thereafter, with print issues available in October. The series will have rotating artists, beginning with Brian Ching (SUPERGIRL) and followed by Lynne Yoshii of the DC Talent Development Workshop. The GOTHAM CITY GARAGE #1 cover by Rafael Albuquerque will debut at a later date; the variant cover by Dan Panosian is available to check out here. Chapters can be downloaded via the DC Comics App, readdcentertainment.com, iBooks, comiXology, Google Play, Kindle Store and Nook Store.